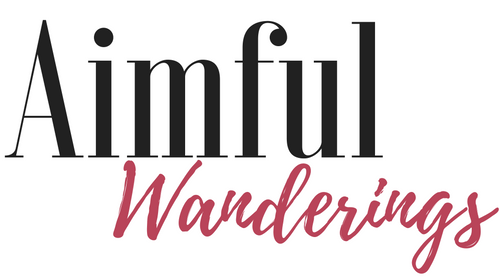 I’m Amy (Aim) of Aimful Wanderings… clever right? This blog is a sampling of my favorite pastimes include drinking dark strong coffee, playing with my dogs, traveling with my hubs, cooking and eating, being in nature, knitting quick and unique projects with good quality yarn, exploring new or not so new places… and a whole lot more. In this blog I’ll be posting about that stuff and more. I’ll write the recipes that I came up with, not exact because I tend not to measure – which is why I don’t bake. I’ll give you my knitting patterns because I don’t follow patterns to the T – it’s about improvising. And I may be a little dramatic in some stories if I’m trying to get a point across. I hope you enjoy and I look forward to reading your comments!